One of the linchpins of the Marvel universe on Netflix, Luke Cage is now available for binge-watching of its second season. 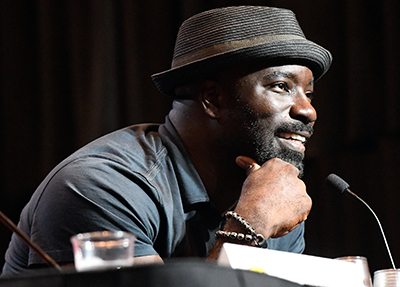 Mike Colter joined us on Sunday at 5:30PM in the Marriott Atrium Ballroom to share some insights about Luke and how things have developed in the second season. Moderator Thomas Parham started out by asking a few Inside the Actors Studio–like questions before opening up the floor to questions from the fans. More than one question focused on the cultural significance of having a bulletproof black man in the current political climate. Colter replied that, in particular, the hoodies that Cage wears are on purpose as a more subtle comment on the current issues, and of course as a black man there is a strong association between that and bullets. But other superheroes are bulletproof, whether it’s them or their costumes, so it’s not something that comes up for them. Hopefully, it will not be so significant to have a black man that can’t be harmed by bullets in the future. It is clear after an hour of listening to Colter talk about Luke and the process of making it all happen, that this is a character that is deeply important to him. We look forward to seeing where the events of season two end up taking him.